Sat., Dec. 20, 2014, 4:14 p.m.
A protest spurred by a Spokane County Sheriff’s deputy statement that angered self-described constitutionalists drew more than 300 people to the Spokane Valley Police Precinct parking lot Saturday afternoon. Many of those in attendance carried rifles, handguns or both. A series of speakers criticized Spokane County Sherriff Ozzie Knezovich and called on him to give back the mine-resistant ambush protected vehicle (MRAP) that the department received for no cost as military surplus. A video of a deputy saying the MRAP was needed to protect deputies from people who stockpile weapons and ammunition, such as “constitutionalists,” went viral after it was posted on the Info Wars website, which is run by radio host and conspiracy theorist Alex Jones. Constitutional activist Gavin Seim said the problem is that law enforcement is becoming increasingly militarized. It’s not about guns or MRAPs but is about liberty, Seim said. “When the government fears the people, there is liberty,” he said. “Nothing terrifies a bully more than someone who will stand up to them.”State Rep. Matt Shea, R-Spokane Valley, told the crowd that Knezovich’s explanation for the deputy’s quote – that he was taken out of context – is hogwash. Shea and Knezovich have been political opponents for several years. The sheriff was one of the only elected Spokane County Republicans currently in office to publicly endorse Shea’s Republican opponent in the November election. At the rally, Shea called on Knezovich to apologize or resign for his deputy’s comment. The Sheriff’s Office released a statement Saturday saying that the deputy should have used the word “extremist” to refer to people who believe their ideology justifies violent attacks. No deputies were seen during the protest at the precinct, which is closed to the public on the weekends. 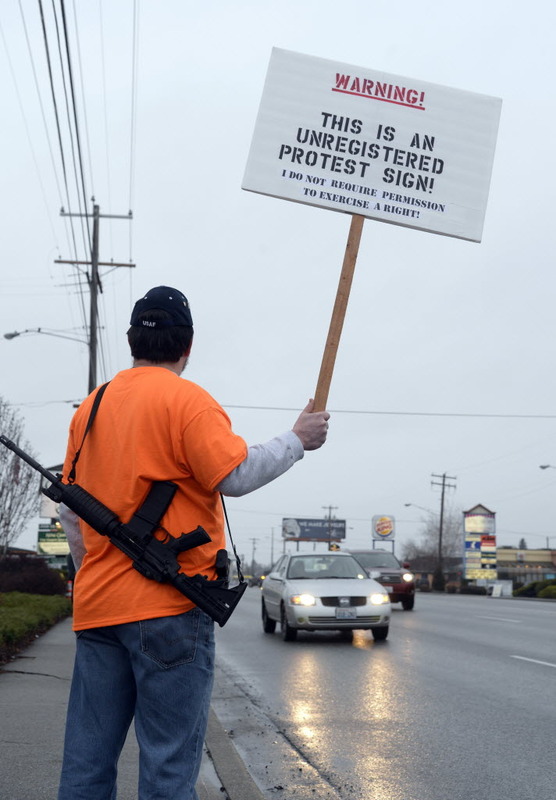 Brad Underhill carried a bright yellow “Don’t Tread On Me” flag and an AR-15 rifle to the event. “I just see a duty as an American to stand up and protest for my rights,” he said. People who believe in the Constitution are not a threat, he said. “I’m not the citizen they should be fearing,” Underhill said. “We’re all very friendly people.”While the event was peaceful, Shea said that a man was arrested for assault at a protest against Initiative 594 outside the Spokane County Courthouse earlier in the day. Spokane Police Department spokeswoman Officer Teresa Fuller said she had no information about an arrest at the event. Spokane County Sheriff’s Office spokesman Deputy Craig Chamberlin said that a SPD officer made an arrest for misdemeanor assault during the protest. I-594 requires background checks on gun sales at gun shows. The Spokane Valley event was organized by M. Scott Maclay, president of the Rattlesnake Motorcyle Club, which he describes as a political action club. Maclay said he believes the response to the video was mishandled and that Knezovich should have apologized. In an interview earlier this week Knezovich said he believes the response against the video is politically motivated and pointed out that Maclay donated money to his election opponent, Doug Orr. Maclay also has an active lawsuit in federal court against Knezovich, the Sheriff’s Office, and the Spokane County Jail. Maclay claims in the suit that he was not given needed medication while he was in jail for four days in February 2011 after being arrested on a civil bench warrant. In 1997 Maclay was the victim of a road rage incident and responded by drawing his handgun and firing two shots over the man’s head, according to past news articles. In May he drew a handgun inside the Timber Creek Grill, 9211 East Montgomery Ave., during a meeting of the Inland Empire Motorcycle Coalition. Maclay said he drew his gun in self defense during a fight with members of another motorcycle club who were also armed. No arrests were made after those involved in the incident declined to press charges, Knezovich said. The Inland Empire Motorcycle Coalition has since voted to ban Maclay and other members of his group from future meetings, saying his actions created a “bad image” of area motorcyclists. In 1984 Maclay was arrested for second-degree burglary, a felony, under his previous last name of Dunwell. He was convicted of first-degree criminal trespass, a misdemeanor. In 1999 he was charged with reckless endangerment and malicious mischief, but the charges were dismissed. Published: Dec. 20, 2014, 4:14 p.m.